Nose work is the only activity that allows the dog to live instincts and use his natural abilities in such an enjoyable way for both himself and his human companion; this helps the dog to find balance and self-confidence and to develop a relationship of serene cooperation with his owner who will discover a new understanding of his dog and of it's singular capabilities. 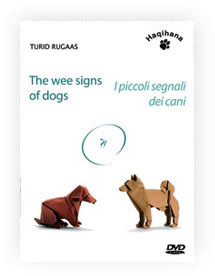 Turid Rugaas reads dogs, providing the key to interpret their language: vocal, body, and calming signals and she encourages us to adapt to theirs to avoid problems and get on better together. The charming and characteristic presentation skills of Turid Rugaas have been enriched with images on file from filming done worldwide by our team. Turid’s dream is to live in a society where dogs are respected and appreciated for what they are. No one who jerks or drags the dog by his neck; on the contrary, he can sniff interesting smells and look at what is going on around him. If you teach him quietly to walk well with a loose leash, remembering that you should respect his natural curiosity about his surroundings, the relationship with your best friend will grow and flourish. video unites theory and practice in seven different locations to explore what leash work means to Turid and how to learn and practice the techniques and gain an understanding of the philosophy behind them. This menu driven DVD allows you to choose any language with subtitling. Barking is more than just noise. Barking is natural and almost all dogs bark. It is one of the many ways dogs communicate with each other as well as with humans. 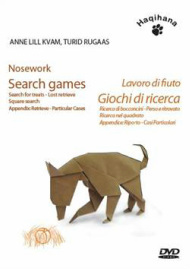 In this book, author Turid Rugaas, well known for her work on identifying and utilizing canine “calming signals,” turns her attention to understanding and managing barking behavior. Think of barking as your dog’s language. By learning to identify what your dog is expressing when he barks, you can take steps to minimize their negative effects. • How to utilize knowledge of canine body language to help you communicate with your dog before barking gets out of hand. • Barking characteristics of different breeds and groups of dogs. • How to recognize six types of barking and their causes. • Step-by-step training methods to solve barking problems. At last, a simple way to teach your dog to walk on a leash without pulling your arm off! In My Dog Pulls. What Do I Do? you will learn Turid’s quick and easy method to train any age, size or breed of dog to walk calmly and quietly on a loose leash. Her approach is humane and based on a solid understanding of why dogs pull and how to work with the dog’s nature and the environment to overcome the problem. City, town or country walking will become more relaxed, reducing stress for dog and owner. • Why dogs develop pulling problems. • Simple steps to retraining even a vigorous puller. • How to rehabilitate the puller with clear, helpful paragraphs. • Correct use of leashes, collars and harnesses. What works, what doesn’t. • Troubleshooting problems that arise during training. 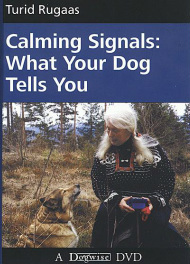 The DVD shows footage of many calming signals, how dogs use them, and how you can use them to calm your dog. This is the DVD format and companion to the popular book, On Talking Terms with Dogs. Note - this is not a professionally filmed DVD rather one done by dedicated amateur dog people; however, it does a good job of illustrating the canine body language subjects it addresses. • Become a keen observer of canine behavior at home, in the community and among dogs to get better behavior and build a solid relationship. • Filmed by the author in lovely outdoor settings, see the signals in action while Turid narrates.